China has rejected calls from the US and the EU to release a prominent dissident as "unacceptable". Liu Xiaobo is facing trial for subversion after calling for political reform in China. Both the European Union and the US urged China to release Mr Liu and end the harassment of other citizens who signed the pro-democracy Charter 08. China's foreign ministry said the calls for his release were an attempt to interfere in China's internal affairs. After a year in detention, Mr Liu's lawyers said last week that prosecutors would try him on charges of inciting subversion of state power. He was detained in December 2008 after co-writing Charter 08, a petition calling for radical political reform in China, including democratic change and respect for human rights. 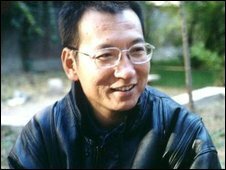 Despite the wishes of radicals like Liu Xiaobo, since Tiananmen there has not been much appetite here for democratic reform. People have grown richer, and are largely content under the Communist Party's rule. But ordinary people, hardly what you would call political radicals, have grown hungry for legal rights, and progress was made in creating an independent and professional judiciary. That has now stopped. He faces 15 years in prison if convicted. On Monday, both the US and the EU urged China to release Mr Liu and end the harassment and detention of citizens who call for political reforms. "The accusations are unacceptable to China," foreign ministry spokeswoman Jiang Yu told journalists at a regular news briefing. She said the rights of Chinese citizens were guaranteed by the law. "I want to stress that Chinese judicial bodies handle cases independently. Outsiders have no right to interfere. We oppose any external forces using this case to meddle in China's internal affairs or judicial sovereignty." More than 300 academics and intellectuals have signed Charter 08 and have expressed their solidarity with Mr Liu. One of the signatories, Xu Youyu, told the BBC Chinese Service: "If Liu Xiaobo is guilty, then we all are." Mr Liu is a writer and former university professor who has spent much of his time since being a leader in the 1989 Tiananmen Square democracy protests either in prison or under various forms of house arrest or close monitoring. He has continued to write and publish on the internet, calling for democratic pluralism in China.